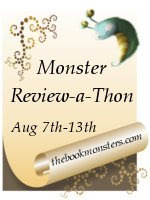 Welcome to Day 3 of the Monster Review-a-Thon! We are almost to the half way point. How are you holding up? Getting a lot done? Today's mini-challenge has us looking toward the future... well, future reviews. Here at The Book Monsters, we try (try, being the key word) to stay ahead of the game by setting up future posts for review books. We do this for a few reasons. But mostly it is to let us cut corners when it comes to review time. The post is already set up, so all that is left is our thoughts. For mini-challenge #3, your goal is to go through your review, needs review, or whatever else pile you may have and set up some future posts. I do have one title that must have the review posted next month and two that I hope to get reviewed later this week (for sure this year) so that's three I can set up and see how it works. update: the post is all set up and ready for me to plug in my thoughts after the book is read. I liked that. No stress about forgetting something...either my thoughts worrying about the details or the details worrying about my thoughts! It's a nice feeling and I used to get this done more often, so I'm hoping to get a bunch with the basic format so I can just review as soon as done with reading the book. :) Great job!